Using ecc32.exe/emake.exe with FinalBuilder is very easy. That's because FinalBuilder has "Use EurekaLog compiler" option. 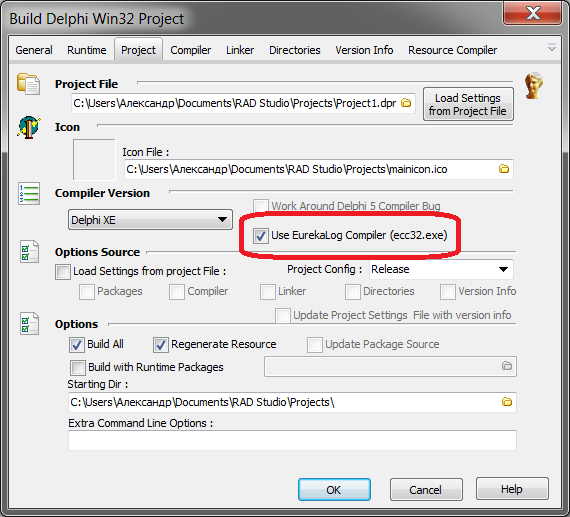 All you need to do is to open properties of each "Build Delphi Win32 Project"/"Build C++ Builder Win32 Project" action and to enable "Use EurekaLog Compiler" checkbox. That's all. Please, refer to FinalBuilder's help file for more information: Actions Reference / Compilers / Embarcadero / Build Delphi Project. • FinalBuilder will always build your project with your default EurekaLog configuration (unless you override configuration). • Extra command line options are passed to ecc32.exe, so you may add any additional EurekaLog-specific switches. In other words, when "Use EurekaLog Compiler" option is enabled - FinalBuilder will call ecc32 instead of dcc32, --el_prepare/--el_alter_exe options are not used. Therefore, you can specify additional options for ecc32 (such as --el_config, etc. ; as well as arguments to dcc32) via FinalBuilder's "Extra Command Line Options" option. • You may need to specify "Extra Command Line Options" option. This depends on your project's configuration. See Minimum parameters needed to know about required parameters. Instead of manually specifying options - we recommend you to setup your project options as specified here and mark "Load settings from project file", "Compiler" and "Linker" checkboxes on "Project" tab in FinalBuilder action's properties dialog. You may also uncheck "Load settings from project file" options, but setup compiler and linker options in the manner which is described in the above mentioned article. • Alternatively, you may uncheck "Use EurekaLog Compiler" option, and add new action to your FinalBuilder script. Add "Exec program" action right after your "Build Delphi Win32 Project" action. Insert a call to ecc32/emake with your custom options to this new "Exec program" action. • FinalBuilder will not execute build events from MS-Build configuration. Therefore, if you have added a call to ecc32/emake/ecc32speed to your post-build event - it will be ignored.